Qigong has gained prominence through a variety of traditions and schools, such as Confucianism, Taoism, Buddhism, martial arts, and medical. The word “Qigong” derives from two Chinese concepts: “Qi,” which refers to the vital energy of the body, and “gong,” which refers to the skill of working with the qi. Qigong operates on the premise that we are all born with an inherent degree of vital qi energy, also called prana in Indian traditions, and that this energy depletes or stagnates through exposure to a variety of conditions and experiences such as stress, injury, trauma, overwork, poor nutrition, pollution, and alcohol/drug use, among others. As a result of these factors, the qi ceases to circulate freely in the body and we experience pain which increases, leading to disease and even death. Qigong works by coordinating the body, breath, and mind in order to gather, circulate, and direct qi within ourselves in order to unblock the stuck and stagnate energy so that it can flow freely within the channels or meridians, of which there are 12 in the body according to traditional Chinese medicine. In addition to the twelve main meridians, there are eight other channels considered particularly important to the practice of qigong. Often referred to as the “8 Extraordinary Vessels,” they include the conception vessel (running straight along the front of the body), the governing vessel (running straight along the back of the body), the penetrating vessel, the girdle vessel, the yin linking vessel, the yang linking vessel, the yin heel vessel, and the yang heel vessel. The conception vessel and governing vessel are especially important with regards to qigong practices that circulate energy around the body in orbits referred to as the microcosmic orbit (ranging the torso) and macrocosmic orbit (including the limbs and extremities). 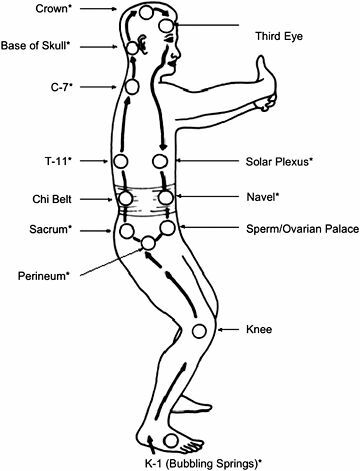 When energy flows freely through particular meridians during qigong activity you can feel sensations of tingling and warmth developing in various parts of the body indicating the presence of qi. External qigong, in which a practitioner performs qigong on someone else . Whereas most of the time people will practice internal qigong, if they have developed enough energy to heal others or if they demand extra qi due to illness they may involve themselves in external qigong. In regards to static versus dynamic practice, qigong operates on the Chinese principle of yin and yang. Dynamic qigong is more yang in nature, meaning that the body adjustment favors motion, opening, relaxing, being soft, bending, and ascending, whereas static qigong is more yin in nature, meaning that the body adjustment favors stillness, closing, tightening, being hard, stretching, and descending. In both static and dynamic qigong, breathing in and contemplating images of fire pertains to yang, whereas breathing out and contemplating images of water pertains to yin. Static qigong includes Zhan Zhuang or standing tree/post meditation, in which a practitioner maintains an upright standing posture with knees slightly bent and hands outstretched and held before the chest for a duration of time. As a result of ten to twenty minutes of this practice, qi and blood circulation increase to remove blockages that contribute to an inability to feel what is happening in the body. Although tension and anxiety contribute to this inability, Zhan Zhuang qigong restores our natural sensitivities forming new mental imprints of tension release. Spontaneous movements may also occur during this practice indicating qi flow. Dynamic qigong includes Baduanjin or Eight Pieces of Brocade, in which a practitioner engages in a series of eight exercises that circulate energy within the body using especially the palms of the hands. The Eight Pieces of Brocade emphasizes body alignment and especially the coordination of body movements with the breath. Each exercise in the series is meant to focus on a particular physical area and qi meridian. In addition to cultivating and promoting qi, this practice can improve the flexibility of the tendons, strengthen bones, and regulate internal organs. While a person can perform the Eight Pieces of Brocade standing or sitting, the majority of people perform it standing.